Eating less and moving more are not as easy as they sound. For many time-poor, food-loving Singaporeans hoping to slim down, it can be a struggle to eat healthily and commit to regular exercise. For those who are obese, trying to lose weight poses even more of a challenge, doctors say. Dr Tan Chun Hai, consultant of general surgery at Khoo Teck Puat Hospital, says: "Obesity is classified by the World Obesity Federation as a chronic, relapsing and progressive disease. "It's a common myth in the eyes of the public that obesity is a sign of mental weakness and that it can be controlled by diet and exercise. There are many other factors that can come into play, such as genetic factors, psycho-social and socio-economic factors." Dr Asim Shabbir, director and senior consultant at National University Hospital's (NUH) centre for obesity management and surgery, says: "Certain physiological mechanisms in our body are designed to defend against weight loss and conserve energy. Thus, losing weight is challenging and maintaining weight loss after dietary and exercise intervention even more so." When you try to lose weight, your body defends itself against dipping too far below a certain weight or "set point", he adds. "This regulation becomes abnormal in obese people. Even if this set point is abnormally high, the body defends itself." Bariatric surgery, or weight loss surgery, can "reset that set point", says Dr Shabbir, who is also president of the Obesity & Metabolic Surgery Society of Singapore. As Singapore faces challenges such as obesity and related diseases such as diabetes, bariatric or metabolic surgery, which can swiftly address both conditions, is gaining popularity in some hospitals here. Over the last five years, Singapore General Hospital (SGH) has seen a 10 per cent increase year-on-year in the number of patients undergoing bariatric surgeries. More than 700 patients have gone for such procedures there since 2008. At National University Hospital, the number of bariatric surgeries performed rose from five in 2008 to 93 in 2015. Dr Lim Chin Hong, consultant at SGH's department of upper gastrointestinal and bariatric surgery, attributes the rise in bariatric surgery at the hospital to greater awareness of its efficacy. Research shows that bariatric surgery is more effective for long-term weight loss compared with dietary modifications or exercise, says Dr Lim, who will be speaking at a public forum on the topic later this month. Trials have also shown it to improve or resolve conditions such as diabetes, hypertension, high cholesterol, sleep apnea and fertility, he adds. "Most patients who are overweight and make exercise and dietary modifications tend to have a high rate of failure and relapse. Surgery not only restricts food intake, but also changes gut hormones that promote satiety; suppresses hunger and increases metabolism," he says. "This is why metabolic complications like diabetes and hypertension improve immediately after surgery, even before the patient has lost significant weight." That is not to say that those who are overweight should give up on exercise or dieting altogether. Two common types of bariatric surgery are vertical sleeve gastrectomy, or gastric sleeve, which involves removing a portion of the stomach; and Roux-en-Y gastric bypass surgery, a more complex procedure where a small pouch is created from the stomach. The operation creates a connection from the stomach to the small intestine, bypassing portions of the digestive tract. In Singapore, bariatric surgery is generally considered only for patients with a body mass index (BMI) - weight in kilograms divided by the square of one's height in metres - of above 32.5 if they have obesity-related illnesses such as diabetes, or a BMI beyond 37.5 if they do not. One is considered severely obese with a BMI of 35. In Singapore, 8.6 per cent of adults aged 18 to 69 were obese in 2013, Ministry of Health figures show. But Singapore could hit obesity rates of 15 per cent in just seven years, according to Health Promotion Board estimates reported earlier this year. Globally, one in eight adults is obese, according to a major study published last year in The Lancet medical journal, and bariatric surgery is becoming one of the fastest-growing operative procedures, the Clinics In Surgery journal reported last year. While some previously obese food lovers express frustration at having to eat much less after undergoing bariatric surgery, they often speak of the procedure with the fervour of the converted. Some bariatric patients interviewed by The Sunday Times lost 60kg to 70kg post-surgery; some no longer take diabetes medication. But bariatric surgery is not a magic bullet, caution doctors. Dr June Lee, consultant of surgery at Changi General Hospital, says: "A patient may revert to his original weight and health issues, including diabetes, depending on factors such as maladaptive eating habits, lack of exercise, his age, or the duration and severity of his diabetes before the surgery." But with proper self-care, NUH's Dr Shabbir says the physical effects of the surgery can be accompanied by a better quality of life. Ms Or Lee Hwa, 51, returned to a sport she loved after bariatric surgery. 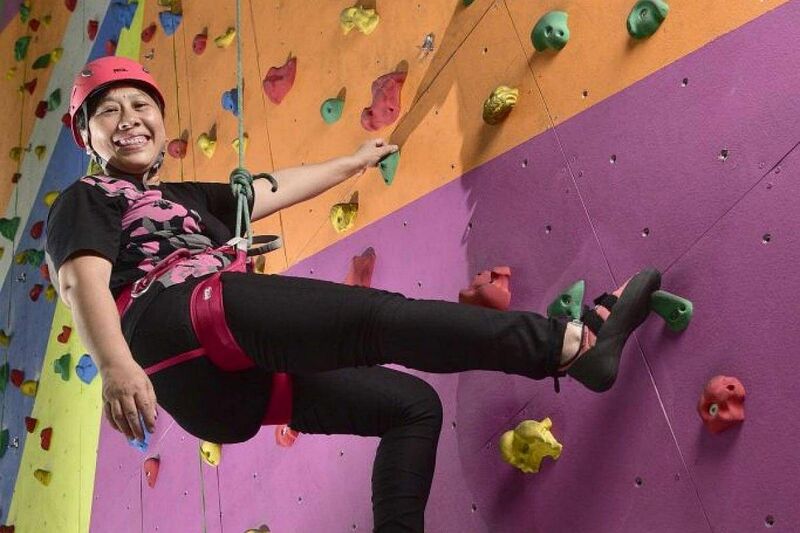 In her 20s, she started rock climbing, a hobby she pursued into her early 30s. But after she got married and had two sons, now aged 13 and 15, her weight crept up to 94kg and the youth worker found she could not even run after a bus. She is 1.54m tall. Ms Or, who is married to a 47-year-old project manager, found it hard to find time to exercise as a busy working parent. For several years, she tried to diet by cutting down on oily food and eating "soupy stuff" instead, but she often caved, eating higher-calorie hawker food that was convenient to buy or her children's leftovers. Before gastric sleeve surgery in 2014, she was diagnosed with sleep apnea after she found herself falling asleep randomly at meetings and at the wheel. To address the sleep apnea, which meant she was taking in less oxygen than she needed, she had to use a continuous positive airway pressure machine while asleep at night. After surgery, she lost 30kg and now weighs 64kg. She found she could move more easily and started rock climbing again, even getting certified as a trainer in the sport. The surgery also resolved her sleep apnea. Four spoonfuls of rice are now enough for her meals. She brisk walks every day and clocks two-hour rock climbing sessions a week. "Before the surgery, no matter how much effort I tried to put into dieting and exercise, I couldn't reduce my weight. I don't want to go back to my big self again. I treasure this new lease of life." For a year after her bariatric surgery, Ms Noraidah Osman, 52, kept throwing up. The gastric sleeve surgery she underwent in 2015 involved stapling her stomach to make it smaller and a small part became slightly twisted, resulting in pain and nausea. "Every time I swallowed, I vomited. I was so frustrated," recalls the administrator in the insurance industry. Her body adjusted to these after-effects of the surgery, which eventually eased. It was not the only difficulty she experienced post-surgery. A self-confessed foodie who weighed 104kg before the procedure, she found it hard when she craved certain foods, but was limited by the quantity she could eat. "At first, it was very difficult. Sometimes I felt so frustrated. I had to control myself despite the food in front of me - sambal udang, fried chicken. "You have to ask yourself, are you willing to sacrifice that?" Where she used to eat two bowls of noodles for lunch, she might now eat a little rice and a matchbox-size serving of fish or chicken. Ms Noraida, whose height is 1.52m, took up the surgery because her knees hurt when she weighed 104kg, which affected her ability to walk long distances. When visiting Lombok, Indonesia, in early 2015, she fell and injured her knees. After the incident, she resolved to lose weight once and for all. Before undergoing bariatric surgery, she went through a doctorsupervised weight management programme to assess her willingness to make lifestyle changes to ensure permanent weight loss. During those four months, she lost 18kg and her doctor said she did not need bariatric surgery as she could lose weight on her own. But she felt more needed to be done and went ahead with the operation. After surgery, the nausea she experienced, coupled with a fluids-only diet for a few months, resulted in her losing half her original body weight. This enforced low-calorie diet helped her become more disciplined in keeping a healthy lifestyle, she says. She was thrilled when her weight dropped to 53kg after years of being conscious of being obese and occasionally taunted for being ugly. The doctors advised her to eat more. Now, having lost about 46kg of her original weight, she weighs 57.8kg and goes on daily walks to maintain her weight. When she was younger, she dreamt of trekking up Machu Picchu in Peru, a goal she abandoned for decades because she was obese. Last year, she completed the trek. She has only one regret about her surgery: "I regret not doing this earlier." 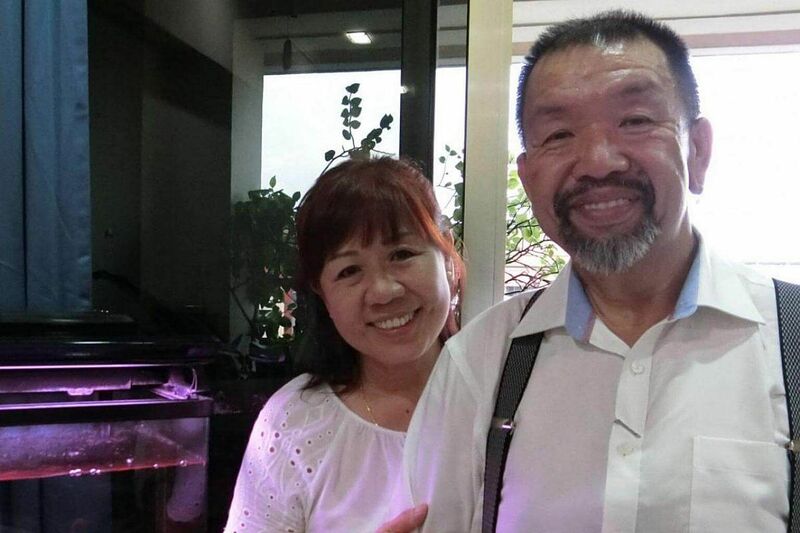 After Mr Goh Sian Kiat Roberto, 58, lost about 60kg following bariatric surgery in 2014, the lifestyle he used to enjoy with his wife changed. The couple, who have no children, used to go for suppers and travel to places in Singapore and Kuala Lumpur for good food. His wife, housewife Jeanie Lim, 58, says: "Both of us used to order enough for three or four people. It was a drastic change. Now, we share a packet of food. "It was like feeding a baby at one point, when he had to eat half-boiled eggs after the surgery. If he ate too fast, he felt nauseous. "I feel sorry for him. He loves to eat, but he can't." Mr Goh, a taxi driver who also had diabetes, resolved to get gastric bypass surgery after he saw its effects on one of his passengers. He adds that he also wanted to be able to be around to care for his wife in the future. He had tried various diets - for example, eating only fruit for a few months, but ended up losing only 5kg. He was discouraged by other attempts that resulted in losing just half a kilogram a month. Post-surgery, Mr Goh, standing at 1.73m tall, went from 138kg to 80kg in a year. He now weighs 82kg and does not take medication or twice-daily injections anymore for his diabetes. On restricting his food intake, he says: "I went through so much suffering, I don't want to go back to what I was before. My health is better now." These days, he eats dishes such as fishball soup at the hawker centre, instead of scarfing down char kway teow on top of a helping of economy rice. He says: "I miss it, but I don't regret it. I try and avoid places with my favourite foods. Sometimes, I just smell the food. Once in a while, I'll walk to zi char eateries, take a look and walk away." First, Madam Salmah Ahmad, 63, had bariatric surgery, then her husband, followed by their daughter. 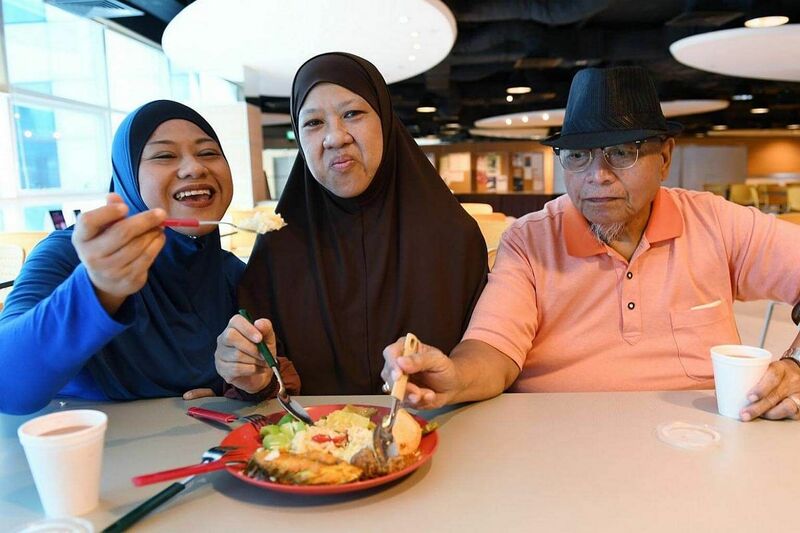 Madam Salmah, a housewife, and her husband, retiree Samat Said, 69, lost about 30kg each. 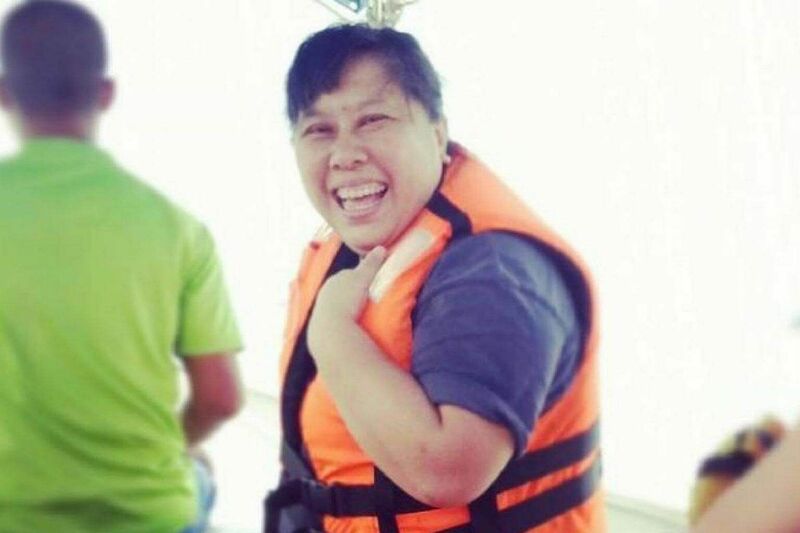 Their only daughter Sakdah Samat, 38, registered a massive loss of about 71kg. The family members were so enthusiastic about their life-changing weight loss that they persuaded three others - a relative and two friends - to go for surgery. In 2012, the couple, who have two adult sons of regular weight, decided to undergo gastric bypass surgery on their doctors' advice. They both had diabetes and hypertension. Mr Samat had high cholesterol as well and had undergone operations in previous years to address complications from diabetes, such as leg infections. A pizza maker, Ms Sakdah stands at 1.53m tall and says her parents persuaded her to follow suit as she weighed about 160kg at her heaviest. She now weighs 89kg. Madam Salmah went from 105kg to 74kg and Mr Samat, whose height is 1.7m, dropped from 125kg to 96kg. Both no longer take medication for diabetes and other health conditions. "They did not want me to get diabetes. 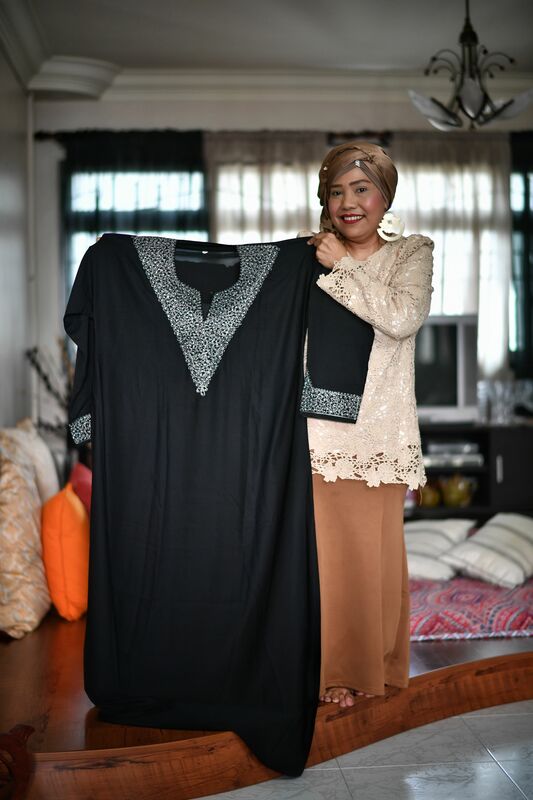 They saw how I tried my best to lose weight and they did not want me to feel down," says Ms Sakdah, who opted for gastric sleeve surgery in 2013. At the time, she was frequently breathless and suffered asthma attacks that resulted in repeated visits to the accident and emergency department. When she was obese, she often stayed home to eat as well, to avoid going out and being the subject of looks and unkind comments. Ms Sakdah says: "We lost so much weight, we can lift our bodies up physically. There is no more pain. We can lift our minds now. I've become a more positive person." Bariatric surgery seems to have transformed Mr Jou Chung Fat's mindset, prompting him to make time for lifestyle changes he did not bother with before. Previously, the 53-year-old mechanic says he "did not care" about his health issues. 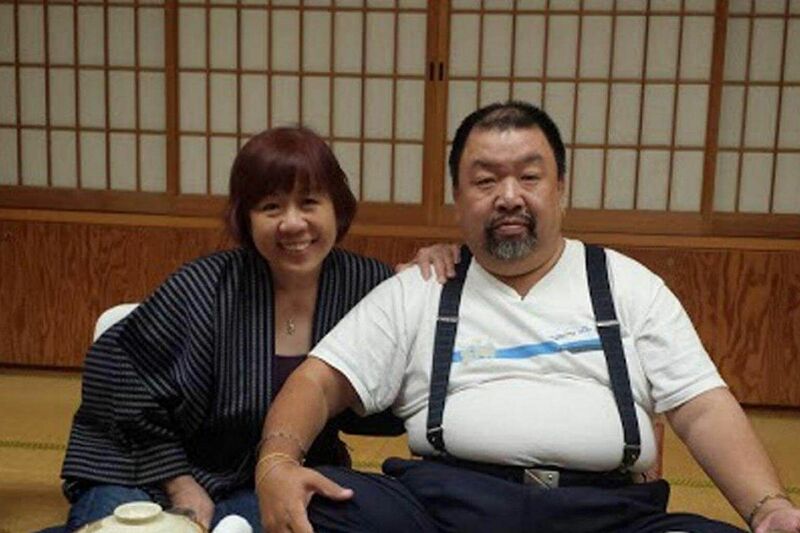 At 1.51m and weighing 72kg, he was overweight and needed insulin injections three times a day for his diabetes, besides taking pills for diabetes, high cholesterol and high blood pressure. There are three main kinds of bariatric surgeries which restrict food intake - the gastric band, sleeve gastrectomy and Roux-en-Y gastric bypass, says Dr Jaideepraj Rao, director of the bariatric surgery programme at Tan Tock Seng Hospital. Of the three, gastric banding, where an adjustable band is placed around part of the stomach to reduce its size, is no longer popular, he adds. There is a long-term risk of infection and sometimes the band erodes, he says. In a sleeve gastrectomy, about 80 per cent of the stomach is stapled, thus reducing its capacity. The Roux-en-Y gastric bypass is considered the "gold standard" for weight loss surgery by the American Society for Metabolic and Bariatric Surgery. In this procedure, a small pouch that holds about 50ml of food is created from the stomach and reconnected to the small intestine, bypassing a particular section to reduce absorption of nutrients, says Dr Asim Shabbir, director of National University Hospital's centre for obesity management and surgery. Patients may see the gastric sleeve procedure as being less risky as it is technically less complicated than the gastric bypass, he says. Significant weight loss and the resolution of conditions such as diabetes, owing to metabolic changes from the bariatric surgery, can be expected. A patient must meet the body mass index eligibility criteria for bariatric surgery, says Dr Rao. Possible side effects, usually stemming from poor compliance with dietary advice after the surgery, include vomiting, faintness, sweating and discomfort, says Dr Shabbir. After the surgery, lifestyle changes are still needed for long-term success, he adds. 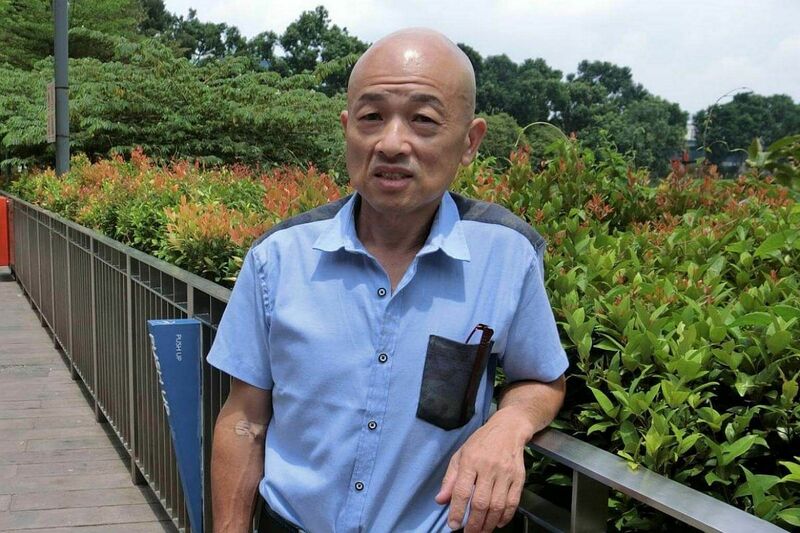 His doctor suggested he take part in a trial at Khoo Teck Puat Hospital in 2014. This ongoing clinical trial seeks to understand how bariatric surgery might benefit diabetics who are not as obese as those who meet the standards for bariatric surgery in Singapore. The trial patients' body mass indexes (BMI) fall between 27 and 32. A minimum BMI of 32.5 is necessary to be eligible for bariatric surgery now. The patients are divided into those who do the surgery and those on a non-surgical regimen involving diet, exercise and diabetes medication. 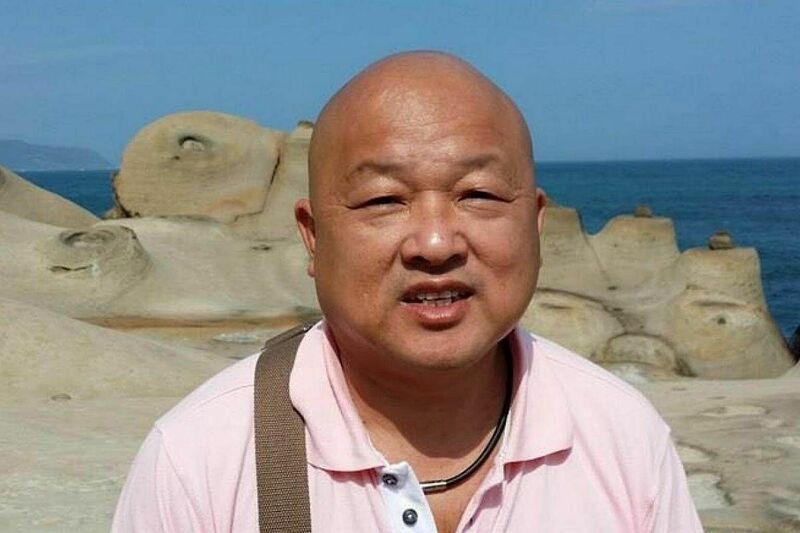 Since gastric bypass surgery two years ago, Mr Jou has lost 25kg and now weighs 47kg. His health has improved and he does not take medication or injections. "I don't feel like eating much anymore and don't have the appetite I used to have," he says in Mandarin. Mr Jou, who is single, says he previously had no time to exercise as he works six days a week, but even though he has not changed his job, he now finds the time to walk every day after work. The results from the surgery have spurred him to adopt healthier habits, he says.